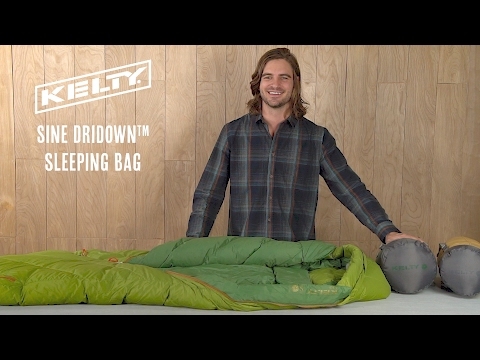 Kelty’s got your back during your next chilly night in the backcountry. With the Sine 20° DriDown™ Sleeping Bag, you get the best of both worlds of comfort and light on weight. The Arc Zipper System is there to provide a natural arm motion when opening the bag and for dual venting. The water-resistant 800 fill DriDown™ stays drier, lofts better, and dries faster. On warmer nights, leave unzipped and use like a blanket. Very soft! Great foot zipper! This bag is soft and cozy. It packs down without much effort and lofts again very quickly. The natural arc zipper doesn't make much difference to me as I sleep in a somewhat confining bivy. However, I have really enjoyed pulling my feet out and on top of the bag with the lower zipper when the night gets too warm. The bag has never gotten wet on the inside despite moisture and condensation, and the outside dries off extremely fast when draped over a bush in the sun. The compression sack that comes with the bag is perfect.